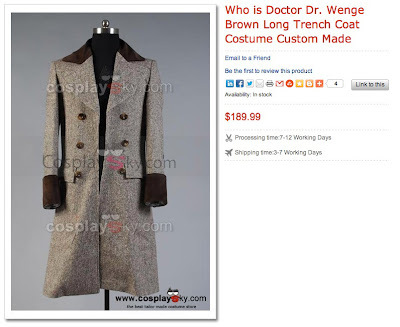 I’ve recently been looking over the Fourth Doctor costumes on offer from Baron Boutique. This month I thought I’d start to have a look at the options from Cosplay Sky. Based in China, Cosplay Sky has been making costumes for over five years and specialise in a lot of Anime and genre films and tv shows. Their style can be very angular with broad lapels and flared skirts. 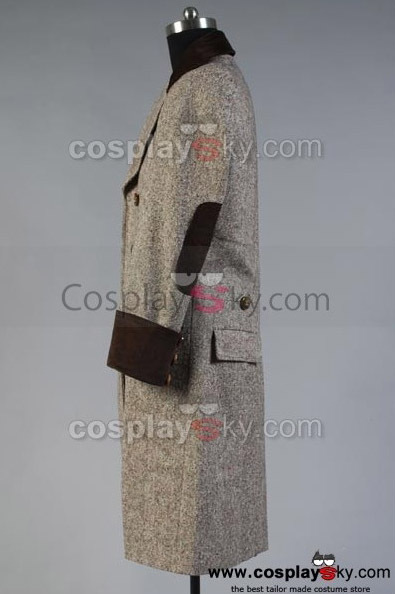 This coat is a replica of the tweed Frock Coat Tom Baker first wore in The Android Invasion. 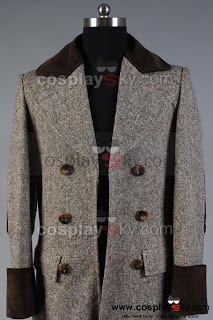 My first point of review is always the fabric for a coat, and from the looks of the photos, they have used a wool tweed material not unlike the Donegal on Matt Smith’s series five jacket. Although not a screen accurate match for this coat, it certainly goes someway to reflect the drape and feel of the original coat. 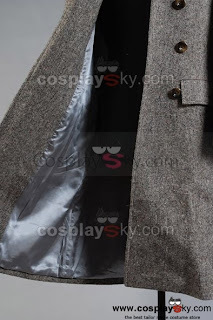 The collar looks to be made from velvet rather than the thunder-cord corduroy on the screen worn coat, but it is in the right area for colour so not so bad. The buttons on the front are a bit out of position, being in two vertical lines, rather than diverging at the top. The choice of buttons isn’t too bad, though the cuff ones should have been a lot smaller - they look very clunky and draw the eye too much. The cuffs themselves are oversized and misinterpreted. They have been done like the cuffs on the Sixth Doctor Frock Coat, but should be flush with the surface of the sleeve. The elbow patches on the sleeves look very large and almost take up half the length of the arm! 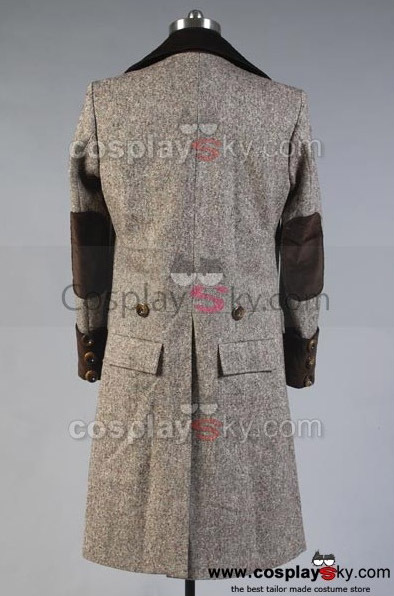 The back of the coat seems to be lacking the princess seams and the buttons are too widely spaced. The back split is dead centre, which isn’t right, as it should under and overlap. The large pockets on the back of the coat are placed way too high and far too close to the centre. Quite how you would reach to put anything in them is beyond me. Lengthwise the coat looks to be about right, with a decent flare to the skirt, though the lower back could have been more nipped to emphasis this. The lining is a pale silverish blue, which actually isn’t far off the correct colour. 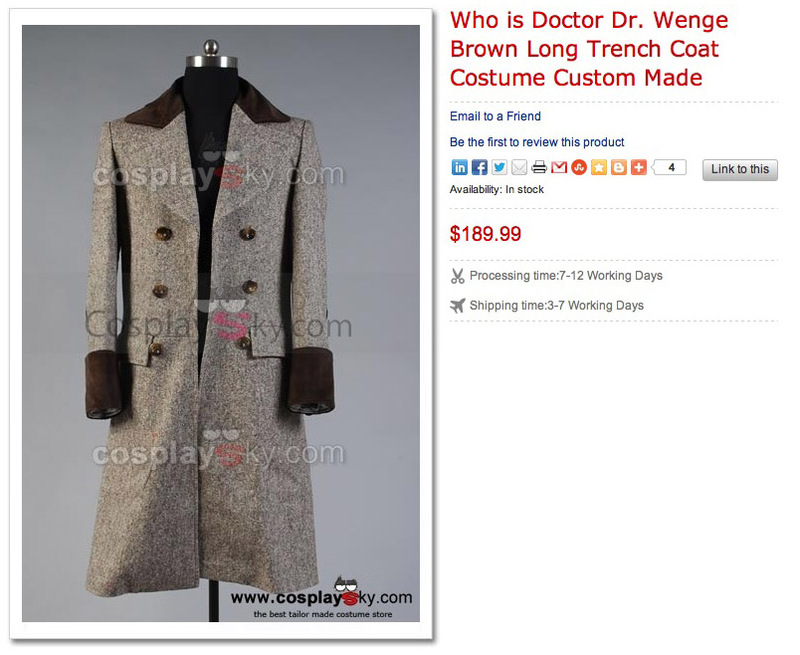 All in all this isn’t such a bad coat. 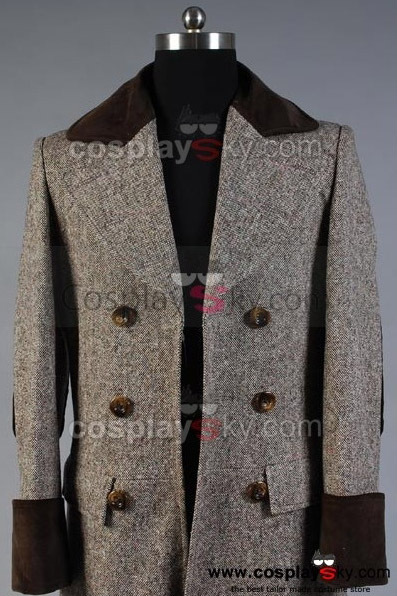 I’m surprised as to how it looks, compared to some other the other coats Cosplay Sky offer, which I shall be reviewing over the coming months. Check back each month for a new review. I actually have this very coat from Cosplay Sky. I have worn it for about a year and it really photographs great at cons! The lining looks great but is rather fragile. They've unfortunately lined the pockets with the same fabric, and I have repaired many holes. My constant removal of sonic screwdriver and bags of Jelly Babies may have contributed to the wear!